When Indiana Department of Education officials talk about accountability, they mean student performance on standardized tests. Scores on the ISTEP+ and End of Course Assessments factor into school letter grades and teacher evaluations. What tests do Indiana students take? You’re probably most familiar with the ISTEP+, or Indiana Statewide Testing for Educational Progress Plus (but nobody calls it that). Students take the the ISTEP+ in English language arts and mathematics every spring in grades 3-8. Students are also tested in science in grades 4 and 6 and in social studies in grades 5 and 7. Third graders take a reading skills test called the IREAD-3 (some schools also administer diagnostic tests to track students’ progress in grades K-2). Students who don’t pass the IREAD-3 receive remediation and have to take the test again over the summer. If they don’t pass, then they have to take state tests against the next spring as a third grader. That usually means retention. High school students take End of Course Assessments, or ECAs. These tests are administered to students enrolled in English 10, Algebra I or Biology I. Students have to pass the English and math tests in order to graduate. Unlike tests for younger students, ECAs aren’t administered during a specific time of year. Students take the tests when they finish one of the required courses and can retake them if they don’t pass. Why are these tests given? Indiana lawmakers passed Public Law 221 in 1999, two years before No Child Left Behind took effect. The law gave the state authority to intervene in schools that failed to meet benchmark accountability standards. That meant assigning all schools a rating so the Department of Education could monitor their progress. Today all Indiana public schools receive a letter grade in accordance with the state’s NCLB waiver. These letter grades are calculated from scores on standardized tests. Letter grades for elementary and middle schools come from student performance on the ISTEP+. For high schools, the calculation is a little more complex. It comes from scores on ECAs, graduation rates and college readiness indicators, like participation in AP and IB classes. How are the test results used? Scores on Indiana’s standardized tests are used to assess students, teachers and schools. Third graders who don’t pass the IREAD-3 are at risk of being held back a year. High school students have to pass their ECAs to graduate, or else receive a waiver. Indiana’s educator effectiveness law requires teachers be evaluated annually. Scores come from a combination of factors, including classroom observation, lesson plans and growth model data (more on that in a minute). School corporations can chose whatever assessment model they feel works best, but all scores have to incorporate some measure of student performance, like standardized test scores. There’s another part of that law: Merit pay. Though some districts pushed through contracts shortly before the new teacher evaluation law took effect, all Indiana school corporations will eventually have to pay for performance. Scores on the ISTEP+ and ECAs are the predominant factor in calculating school letter grades. The state can intervene if a school receives an “F” for six straight years. That’s what happened last year at four Indianapolis Public Schools and one high school in Gary. Here’s how it works: The state looks at all of the students who scored the same on the ISTEP+ in a given year. Then it tracks their academic progress over the next school year, again using standardized test scores. That helps the Department of Education determine how much growth on the state’s test is representative of one academic year. Students are then assigned a percentile based not on how well they scored, but on how their year-to-year scores ranked against their peers. That means a student could fail two years in a row and still show high growth as long as he or she made sufficient gains in learning. 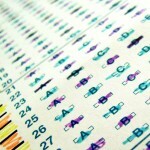 Do special education students take the same test? Many special education students take the ISTEP+. Some receive special accommodations meant to level the playing field. For example, a student might get extra time or the help of an interpreter. Accommodations are different than modifications, which change the content of the test. IMAST is a modified version of the state English language arts and math assessments administered to students whose special needs interfere with success on the ISTEP+. Students who take the IMAST are still expected to graduate from high school. For students with more severe disabilities, there’s an alternative assessment, called the ISTAR. It’s based on teacher observations and is used to determine what skills the student has learned. What happens when Indiana adopts the Common Core? Indiana is one of 46 states that has signed on to adopt new academic standards. The state is working with the Partnership for Assessment of Readiness for College and Careers to design new standardized tests. The PARCC tests should replace the ISTEP+ and ECAs by spring 2015. Does my kid have to take standardized tests? Some parents think all this testing is harming Indiana students, so they want to “opt out.” National organizations that oppose standardized testing say if five to six percent of all parents refused to let their kids take tests, it would invalidate the results. In Indiana, that’s about 56,000 students. A much smaller group of Indiana parents — about 100 — kept their kids at home during state tests this spring. What they did falls in a legal grey area. The Department of Education says state law requires every student be assessed. But test critics say that’s just the opinion of IDOE lawyers. New Indiana Standards Mean A New Test, So How Do We Get There? With ISTEP Dead, Can The New Version Lower The Stakes? Legislation on its way to the governor gets rid of ISTEP by 2017 and assembles a committee to create a replacement. Following frustration over Indiana’s ISTEP+, the State Board of Education took first steps to establish an advisory committee for future versions of the test. Indiana students scored the same or better than the national average in all four categories of the National Assessment of Educational Progress, or NAEP. A longtime Indiana advisor says state officials need to proceed with caution as they consider the future of the statewide ISTEP+ test. MCCSC Superintendent Judy DeMuth says schools in her district will not take the formative Acuity test during the 2015-16 school year. Indiana lawmakers will continue discussions on a number of education-related topics in study committees this summer. School districts will be able to choose their own formative assessment under the new state budget. The testing company signed on to produce Indiana’s standardized testing system for the next two years is in trouble over security concerns in other states. Senate Bill 566 continues to move through the legislature, despite State Board of Education moves to keep the ISTEP+.